They say Archimedes had his breakthrough “Eureka” moment while sitting in a bathtub. Seeing the water level rise as he got in, he realised he could measure the volume of irregular objects by measuring how much water they displaced. In our previous home, I used to really enjoy the occasional bath. It’s wonderfully relaxing, and it gives you some quiet time to reflect, plan, and come up with new ideas. Being on tank water in our new house, we can’t afford the luxury of wasting so much water, so we don’t have a bath installed. Short showers just aren’t the same! Little wonder then that this idea took me three years to come up with – seeing as I didn’t have a bathtub in which to think it. I got an old pressed metal and enamel bathtub from the tip shop for $30. I temporarily mounted it on besser blocks (cinder blocks) on a concrete pad behind the house. I filled it from our garden water tank (not drinking quality, but still pretty clean). Since the tank is full and we’re in the middle of a rainy patch, we can spare the water at the moment. About an hour later, it was nice and toasty. A hillbilly hot tub! Lying in a bath, watching the stars, listening to the frogs and crickets: pure awesome. 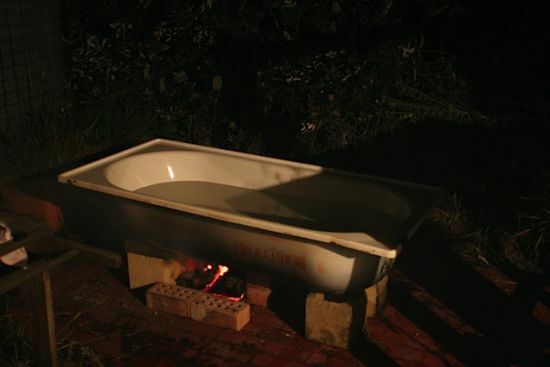 An unanticipated side benefit is that the fire keeps the water warm for much longer than a normal bath would. So you can stay in for hours! One tip: you need to find a flat piece of wood to sit on, or you’ll scald yourself on the hot metal directly above the fire. This was such a success that I’m planning to find a permanent spot for it in the garden. I’m thinking a privacy screen of bana grass, sugar cane and banana trees would be nice, and the water outlet could be piped to a nearby fruit tree. Love this Idea. If I didn’t think the alga and critters would infest it I’d copy yours. I think this is a great idea lying in the dark at night watching the stars.You would have to pay thousands of dollars here for a hot tub.We could only do it here though June though when it gets warmer,right now we have two and a half feet of snow.People here do go to the mineral hot springs in the Winter here in the mountains,although i have not done it myself. Brilliant 🙂 I agree with Wilson about the critters. Would be nice if you could make up a hillbilly lid for the hillbilly hot tub. That’d keep those critters out. June in Hobart, midwinter and enjoying the starlit fire bath overlooking the river and city lights. (If you can see it for the steam) Siphon the water on the garden tomorrow. Life doesnt get much better than that. @Paul: Awesome! You’re braver than me, however, bathing outdoors in winter!